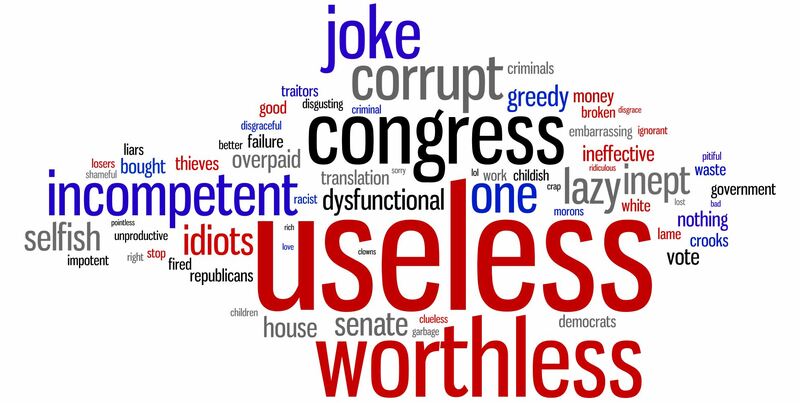 This word cloud represents the most frequently used words from more than 5,000 submissions on Facebook and Twitter to our #CongressInOneWord challenge. (CNN) - It can be tough to agree on a single word to describe something that affects every single American. 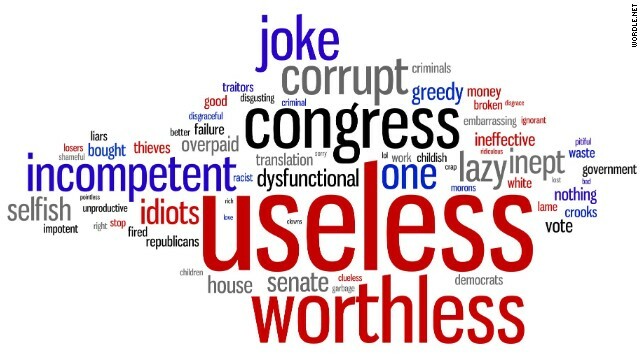 The one-word descriptions give a clear, colorful picture of the pervasive frustration over a disjointed Congress that can’t seem to break the partisan gridlock. An NBC News/Wall Street Journal/Marist College poll released Monday showed that only 3% of registered voters view Congress as “productive." Only 15% of Americans approve the job that Congress is doing, according to Gallup polling. And while dissatisfaction with Congress has faced all-time lows in recent years, a Washington Post-ABC News Poll revealed Tuesday that the disapproval is reaching members in their own districts – where individual representatives have been traditionally safe from the overall discontent. According to that poll, 51% said they disapprove of how their own representative is “handling his or her job” – the first time that figure has cracked 50%, the Washington Post reported. On Facebook, some of the commenters couldn’t restrict their feelings to a one-word rebuke. Click here for a high-resolution version of the word cloud. – CNN's Christina Manduley contributed to this report. So congress stinks, what else is new? The GOP and Dems never get along and it would be nice to see some more unity among them (sometimes there is). However, part of our democracy is having a party say no or challenge the others veiwpoint.